The best offers for Delta’s American Express lineup of credit cards are typically targeted by elite status. 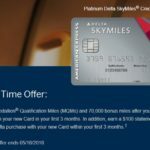 Now the best offer I have seen for the Delta Business Platinum Amex has been emailed to SkyBonus members and application is open to all, apply here. The most I previously recall is 40,000 bonus miles, 15,000 of which counting as MQMs. Apply by July 7, 2013. $150 annual fee NOT waived in the first year. Must not have held any of the Delta Business cards in the past 12 months. This is not an Amex Platinum despite the confusing name, the card does not have Platinum benefits like airline lounge access. I hold this card and like it for the 10,000 MQM boosts for hitting each of $25,000 and $50,000 in annual spend. If you are able to put this amount of spend on a card, and many are these days, you can boost your Delta status-chasing. With Delta rolling out Medallion Qualification Dollars next year, $25,000 spend next year can also eliminate that issue. The boosts are less attractive than the 30,000 MQMs possible with the Reserve cards (15, 000 for each of $30,000 and $60,000) but at a much lower annual fee, $150 versus $450, plus for those needing help of others to get their annual spend, additional cards for the Platinum are free while for the Reserve are $175. Disclaimer: I do not receive compensation of any kind for this offer.